A film set can be a scary place. 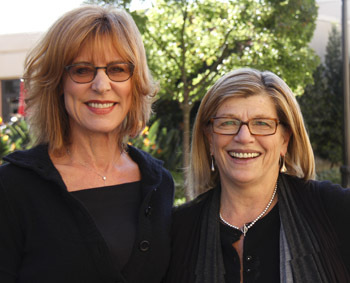 Filmmakers need to worry about safety, budget, lighting and a million other little problems but, on March 7th, when actor/director Christine Lahti visited with students as part of the Production Perks lecture series, she told them that one thing they should never be afraid of is the talent. Lahti directed two actors in a scene from Broadcast News three times. In forty-five minutes, Lahti walked the actors through a cold read, an improvised version and, finally, a final version of the scene with blocking. Lahti also offered plenty of advice for aspiring directors in the audience. In particular, she stressed discussing choices with the actors. Lahti is an acclaimed film, television and stage actress famous for her roles as professional, independent career women in films like Whose Life is it Anyway?, Swing Shift and Running on Empty, for which she earned an Academy Award nomination. Lahti was a constant television presence with her Golden Globe-winning run on the medical drama Chicago Hope and award-winning telepics like the homeless family chronicle No Place Like Home. SCA Professor Jennifer Warren moderated the evening. Production Perks is a speaker series hosted by the SCA Film and Television Production Division, featuring workshops, master classes and Q&As with top television and film directors and actors.